With the battleground moving from single core performance to multi-core acceleration, a new war is being fought with how data is moved around between different compute resources. The Interconnect Wars are truly here, and the battleground just got a lot more complicated. We’ve seen NVLink, CCIX, and GenZ come out in recent years as offering the next generation of host-to-device and device-to-device high-speed interconnect, with a variety of different features. Now CXL, or Compute Express Link, is taking to the field. This new interconnect, for which the version 1.0 specification is being launched today, started in the depths of Intel’s R&D Labs over four years ago, however what was made is being launched as an open standard, headed up by a consortium of nine companies. 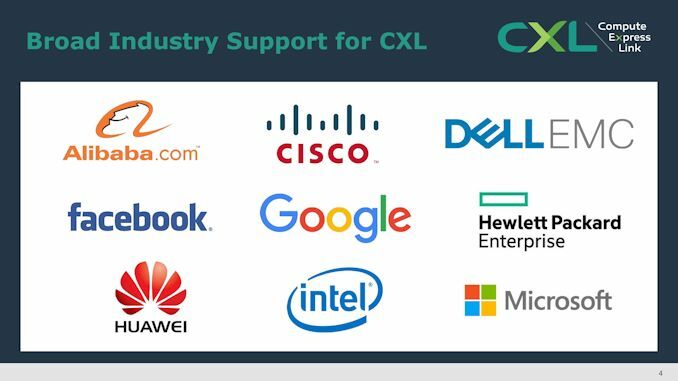 These companies include Alibaba, Cisco, Dell EMC, Facebook, Google, HPE, Huawei, Intel, and Microsoft, which as a collective was described as one of the companies as ‘the biggest group of influencers driving a modern interconnect standard’. 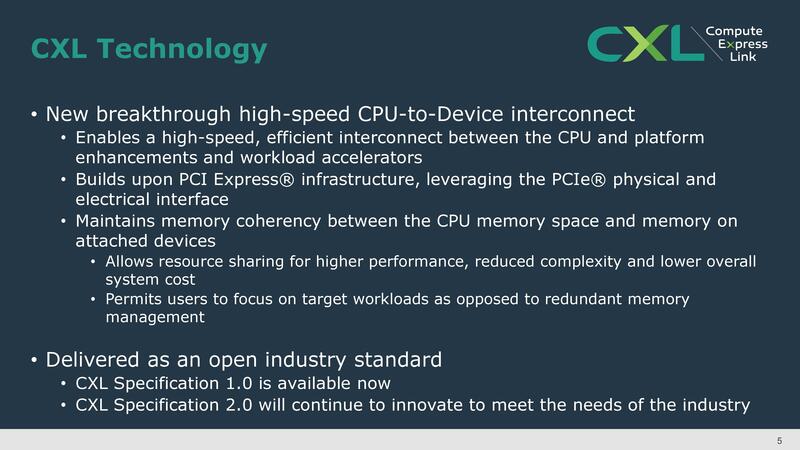 In our call, we were told that the specification is actually been in development for a few years at Intel, and was only lifted recently to drive a new consortium around an open cache coherent interconnect standard. The upcoming consortium of the nine founding companies will be incorporated later this year, working under US rules. The consortium states that members will be free to use the IP on any device, and aside from the nine founders, other companies can become contributors and/or adopters, depending on if they want to use the technology or help contribute to the next standard. At its heart, Compute Express Link (CXL) will initially begin as a cache-coherent host-to-device interconnect, focusing on GPUs and FPGAs. 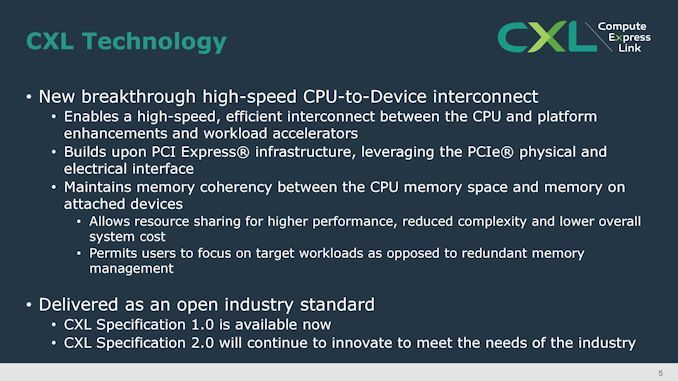 It will use current PCIe 5.0 standards for physical connectivity and electrical standards, providing protocols for I/O and memory with coherency interfaces. The focus of CXL is to help accelerate AI, machine learning, media services, HPC, and cloud applications. 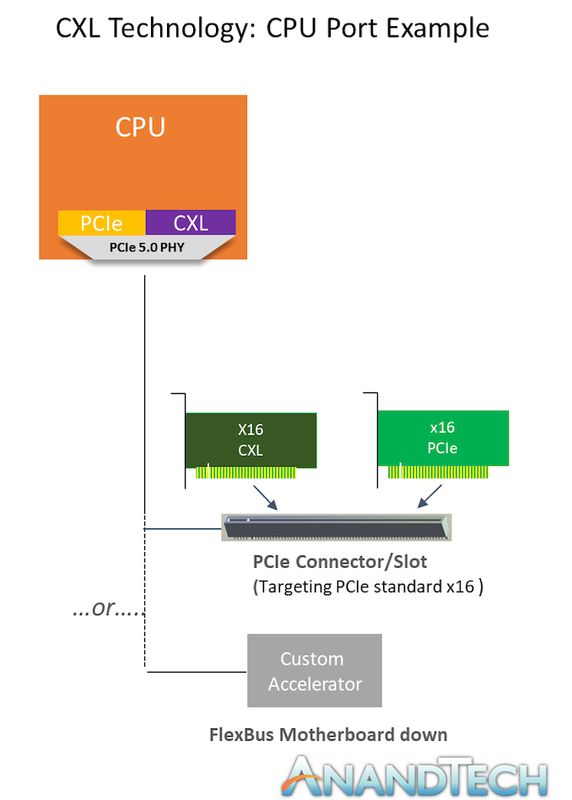 With Intel being at the heart of this technology, we might expect to see future Intel GPUs and FPGAs connecting in a PCIe slot in ‘CXL’ mode. It will be interesting to see if this will be an additional element of the product segmentation strategy. While some of the competing standards have 20-50+ members, the Compute Express Link actually has more founding members than PCIe (5) or USB (7). That being said however, there are a few key names in the industry missing: Amazon, Arm, AMD, Xilinx, etc. Other standards playing in this space, such as CCIX and GenZ, have common members with CXL, and when questioned on this, the comment from CXL was that GenZ made a positive comment to the CXL press release - they stated that there is a lot of synergy between CXL and GenZ, and they expect the standards to dovetail rather than overlap. It should be pointed out that Xilinx, Arm, and AMD have already stated core CCIX support, either plausible future support or in products at some level, making this perhaps another VHS / Betamax battle. The other missing company is NVIDIA, who are more than happy with NVLink and its association with IBM. The Compute Express Link announcement is part standard and part recruitment – the as-yet consortium is looking for contributors and adopters. Other CPU architectures beyond x86 are more than welcome, with the Intel representative stating that he is happy to jump on a call to explain the company’s motivation behind the new standard. Efforts are currently underway to develop the CXL 2.0 Specification. Clearly it's just a coincidence..
Too bad that AMD, ARM, IBM all together have not a great momentum in IT industry. The bulk of the market is in Intel solid hands. So i can see CCIX disappear in the long run.